The Barn is part of a lovely Georgian farmstead set in lush arable countryside. Situated just one mile from the picture postcard village of Bishop Monkton which boasts a babbling brook housing ducks and their baby ducklings and 2 country Inns. 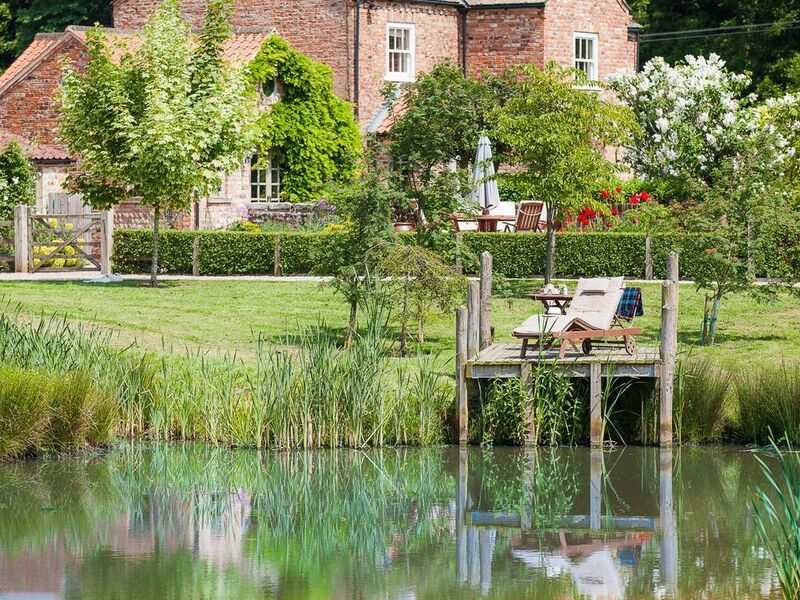 There are 15 acres of paddocks and fields to enjoy as well as a large wildlife pond with Indian runner ducks and moorhens as well as sometimes a heron. Yet not far from this haven of calm, are the beautiful and sophisticated town of Harrogate and the medieval cathedral city of Ripon. Bike rides are popular and the farm is on a designated bike route. There are rabbits and wild deer to see as well as pet donkeys and hens. Something for everyone young and old. The Barn is a lovely brick and stone cottage on our farm.It is private and has its own entrance and enclosed garden which faces onto the paddocks and large wildlife pond.It catches the afternoon and evening sun, and gusts can enjoy eating out al fresco in the summer months. We provide a BBQ on request.The grounds are a haven for wildlife.Herons, owls, canada geese,hedgehogs and once a year young roe deer foraging for food.We keep donkeys, hens, ducks and plan to get pigs and pygmy goats in 2018 for the guests to enjoy. The barn is well equipped, with sheets and duvets, fluffy towels,a fully equipped kitchen, and everything else you would expect to make your stay a happy one.The Barn is let all year round. Summer finds our guests enjoying the private garden, and in winter snuggling around the cosy log burning stove .There are plenty of lovely country pubs nearby for eating out, as well as good restaurants.The elegant spa town of Harrogate is a great day out, for shopping and eating.The famous city of York is close and the enchanting Fountains Abbey just a few miles away.We are at the gateway to the beautiful Yorkshire Dales and there is some spectacular walking on your doorstep or just a short car ride away. I am Angela and own Pottery Lane farm. We have a friendly dog,ducks,hens and donkeys.I try to greet guests once they have settled in but then , tend to leave them to their own devices.I am around to assist in emergencies. We wanted to move to the country once our 5 children had left home.We fell in love with Pottery Lane farm which is peaceful and rural yet still close to Harrogate and all it has to offer.The best of both worlds. The farm is set back from the lane and is peaceful and secluded. The duck pond and ducks are relaxing and funny to watch. There is a log burning stove and a starter supply of logs. delightful secluded garden well stocked with flowers and garden table and chairs to relax in. Gets the evening sun. Notes on accommodation: Free Wi Fi in both cottages. The Barn sleeps 5 and the Hayloft next to it sleeps 2. The cottages can be booked separately or for larger groups of up to 7. Outside: The Barn has its own private garden which catches the evening sun. There are wooden table and chairs and a parasol for confortable outside eating. NB The adjoining field has a pond. The Hayloft has a choice of sitting out areas , on the decking jetty next to the large pond or in the gardens. Great place to stay in lovely location. Loved our little stay at this lovely barn. Had everything we needed, beds were super comfy and the dogs loved it too. We recommend this accommodation highly. It is in a perfect location for visiting the North York Moors, the Dales, Harrogate and York. A week was not enough time for us. Beautifully clean and comfortable. Thank you Angela. A fantastic holiday in great accommodation. The location could not be better & the owner was lovely. Many thanks Bernard. It was a pleasure to have you both as guests. We spent one week in the barn and we were really satisfied. Nice place and great location to explore beautiful Yorkshire countryside. Wold like to come back definitely. We strongly recommend this place. The property is so beautiful and fit our family perfectly. We loved all the animals. Our daughter had a great time with the donkeys. It was very peaceful and a great location to tour Yorkshire. I highly recommend Fountains Abbey. Thank you for a great stay! Clean and tidy great location very quiet. Only slight comment is that we could have done with more crockery as not enough mugs etc. 7 mugs for 4 adults is not enough when using a dishwasher. Also only a two slice toaster - just needed more of everything, apart from that everything great. Ideally located for sightseeing, walking and cycling.The property is on a National Cycle Route (Way of the Roses No 688 ) , which is mostly gentle undulating , quiet lanes.We have an assortment of bikes to borrow free of charge. Harrogate 7 miles, York 24 miles, Ripon 1 mile. RHS Harlow Carr gardens 6 miles,National Trust Fountains Abbey 3 miles, Ripley castle and gardens 4 miles. Leeds/Bradford airport is 40 minutes drive. A car is recommended here to get around. country inns is one mile away. The fashionable spa town of Harrrogate is 8 miles away. The medieval cathedral city of Ripon is 1 mile away. Fountains Abbey is 3 miles away.City of York 24 miles. Booking Notes: Initial enquiries and availability to owner. Non refundable Deposit of 15% due at booking. Balance payable 8 weeks before the commencement of the holiday/stay. No smoking in the property. ( There is a private garden just outside Barn entrance if you wish to smoke) No pets (unless pre- agreed with property owner) Changeover Day: Flexible change over days. Guest should arrive after 3pm and depart at 10 am. Notes on prices: We do short breaks, in mid to low season only, as follows; 2 nights -60%of weekly rate 3 nights-70% of weekly rate 4 nights-80% of weekly rate 5 nights-90% of weekly rate We also do long let winter breaks- Please contact owner to discuss rates.school holidays and Christmas/New year are high season prices.